We should hear the election results in about 90 minutes, 7:00 pm baghdad time. I hope it won't be a 91:91 tie between Allawi and Maliki as some calculations and predictions are showing--such result would be bad for post-eelction negotiations and could seriously complictae cabinet formation. I will try to share some analysis later. Now they say the election commissioners are in a meeting! Looks like there will be some delay. Ok, the election commission press conference begins! The guy is giving a speech...seriously!? By the way, the press conference can be viewed live here, but it's in Arabic. Nice, another speech! This time it's the UN guy. Ok, at least he's saying there were no evidence of major fraud and that the results ought to be accepted by all. They're talking too much. I sense they have bad news for Maliki. Finally. They are reading the results, slowly. Will take a while to go through all of them. Allawi got two seats in Diwaniyah. This may actually be decisive . And Allawi got another 2 in Wassit. I guess he's getting close. 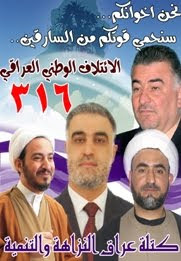 Here we go again, for the third time since 2003, Iraqis are heading to the ballots to choose their representatives. It’s a little different this time. In some aspects it's a little less "interesting"... In December 2005 we walked from home to the voting center (which also used to be where I went to school as a kid) to a soundtrack of mortars and gunfire. Indeed, that ten minute walk was wrapped in so much fear and worry, but also in so much hope and pride. My trip to the voting center will be less interesting this time because I'll be taking the orange line to Arlington where the place is, which happens to be some hotel whose owner will eventually be Paris Hilton. Yes, that's a little boring. In other aspects, though, the election will be more interesting. It’s more difficult to decide who to vote for this time. The fact that voters can pick individual candidates from within lists gives us more options. I can see, for example, that there are many candidates who don't seem to fit into the lists they are running with. I think many have done this with the intention of getting logistic support from those lists and then breaking away after the election and joining other blocs where they would be more compatible. Otherwise, what is this nice young lady doing running on the same list such unsavory characters are running with? Just saying! Anyway, I will go dip my finger in the purple ink sometime tomorrow. Now I need to go back to my homework of researching candidate programs because I haven’t decided on a candidate yet. I know that lady is cute, and I was actually tempted to vote for her, but there are other candidates who better represent the ideas and goals I believe in. By the way, her campaign posters actually caused gridlocks, and in some reports, even traffic accidents!